Challenge athletes during training and games. From the best player on the team to the least skilled, the successful coach is able to adjust the activity so all participants are challenged (Slanty Line Theory). By challenging all, the players continually find themselves in a growth mindset working towards improvement during all practices and games. With the emphasis removed from winning, the players feel less pressure to perform and actually play better and more relaxed in games. By challenging each player to give a complete effort, the coach has created an on field environment that promotes individual and team growth. Develop a positive sports environment. The coach that focuses on creating a positive sports environment places the needs of others first and helps develop the whole person on and off the field. Within the positive sports environment, the coach can create a fun and exciting practice that has an emphasis on skill development and personal growth. Meaningful feedback is provided using appropriate methodology to encourage the athlete to adjust what they are doing for the better, never to demean. Getting to know each athlete on a personal level, sharing personal experiences within the sport and outside of the sport, and offering a mentor/mentee experience lead to the growth of a positive sports environment in which the individual and team will be able to bond together over shared experiences. Build a healthy relationships with the athlete and their support group. Transparency in communication builds trust which leads to a healthy relationship between the coach, athlete, and support group. Athletes who trust their coach are more likely to believe that their coach knows what is required for them to win, has their best interests at heart, and believes the coach can come through with what they promise (Dirks, 2000). This fundamental trust provides the backbone for the athlete to grow more passionate about participation and really fall in love with the activity. Passion for the activity leads to an increased craving for the athlete to practice on their own time. More practice equals increased technical skill development. A win/win for the athlete, team and coach. Coaches – Focus on these three purposes…then watch the success of the players you coach grow in a remarkable manner. 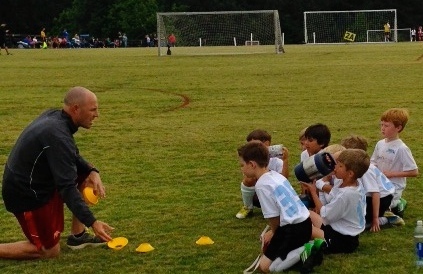 Parents – How does your child’s coach stack up on what successful coaches do and how can all coaches (volunteer and paid) continue to improve? Athletes – Would you want to play for this style of coach? Dirks, Kurt T. (2000, Dec.).Trust in Leadership and Team Performance: Evidence from NCAA Basketball. Journal of Applied Psychology, Vol 85(6), 1004-1012. Awesome blog babe!!! LOVE it!